that I cut out myself! I made the cutest Recycled T-Shirt dress for Mia! How cute is this dress?! Want to make one for your daughter? Head over to Ashley's etsy shop now! And visit her blog lilblueboo. I just love her creativity & ideas! Here is a picture before I added the collar. 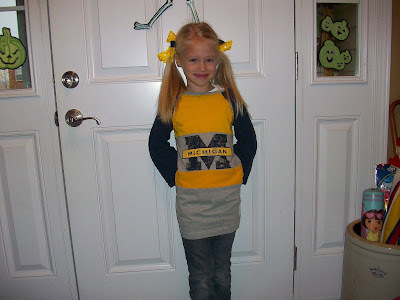 & made a FUN super cute outfit for Mia to wear for Spirit Week at her school! 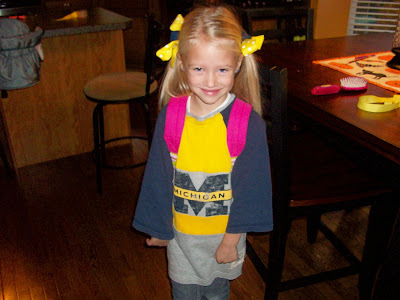 It was "Wear Your Favorite Sports Team Apparel" Day! 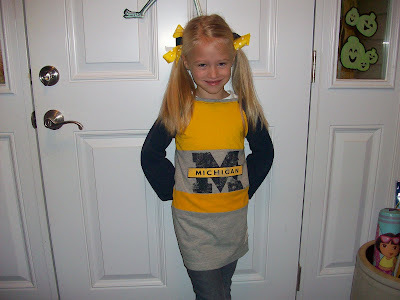 Of course she wanted to wear, none other than, MICHIGAN GEAR! I can't wait to make Sophie & Gracie one. Head over to Ashley's shop & get this pattern! You will be so happy & PROUD of your accomplishments! Love it! 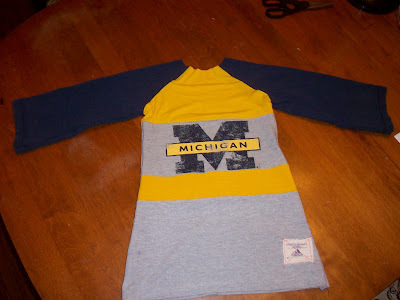 I so want to make my daughters some t-shirt dresses. I just need to improve on my sewing skills first. Your dress turned out wonderful! That is so dang cute! I am getting a sewing machine soon! Gonna start with pillows or somehting easy, but hope to someday make stuff like this dress! Well done! Love, love, love it so much Marta!! You did a fabulous job! SO cute!!! 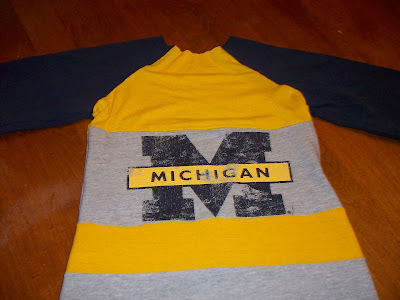 I can't wait till the girl (s) get a little older so i can make these for them! I hope her "i miss Maggie" phase is going away because I am coming home for Thanksgiving SOON...and I can't wait to see her because I miss her so much!